Texans Lend A Helping Hand During Houston Floods Continue : The Two-Way As the flooding covers the southeast portion of the state, not all the news there is bad. Many Texans are assisting through search and rescue efforts. Louisianans are also answering rescue calls. 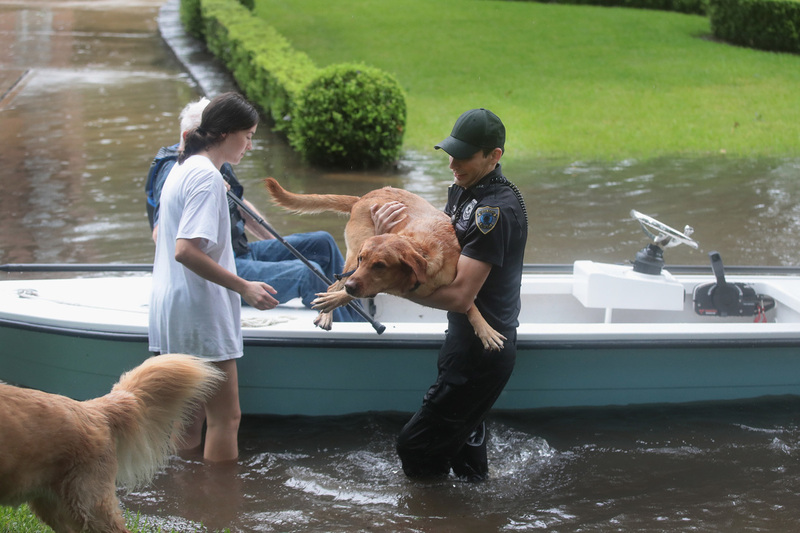 Volunteers and officers from the neighborhood security patrol help to rescue residents and their dogs in the River Oaks neighborhood after it was inundated with flooding from Hurricane Harvey in Houston, Texas. Across the state, Texans are helping Texans. The Galveston County Daily News reported that 15 people were evacuated from a nursing home in Dickinson, Texas. This morning, a picture showing residents sitting in water got attention after Timothy McIntosh shared it on Twitter. McIntosh told The Daily News, the nursing home is owned by his mother-in-law, who sent the photo to McIntosh's wife early Sunday morning. "She said it was a disaster and they were hoping the national guard would come," Kimberly McIntosh, Timothy's wife, told the paper. Requests have gone out in many communities asking for volunteers with boats to help in answering rescue calls. A lot of Texans are responding, but some of that help is coming from across state lines with Louisiana's Cajun Navy. In Baton Rouge, The Advocate reported that some Louisianans had started planning to deliver supplies once roads opened up, while others headed out with their boats for Dickinson, Texas to assist with rescue efforts. Toney Wade, a commander for the volunteer group Cajun Coast Search and Rescue, was among those headed to Texas to help with relief efforts. Wade told The Advocate the group helped with rescue efforts last August in Baton Rouge and would take what they learned from that flood scenario to Texas. He noted that the group is going in with rescues in mind, but that they are capable and prepared to help recover people who don't survive. As The Advocate noted, this is not the first time the two states have worked with each other after a natural disaster. "Many remembered how the people of Texas helped during multiple disasters that have struck Louisiana, opening their doors to Hurricane Katrina and Rita victims in 2005 and sending donations to Baton Rouge flood victims last year," the paper says. In Houston, reporter Brandi Smith and photographer Mario Sandoval were covering the floods for KHOU, the local CBS affiliate and flagged down a rescue team to let them know a man was stuck in the cab of a semi-truck. The crew from Harris County Sheriff's department rescued the man, named Robert. When he got out he said, "I just thank God that you guys were right here to get me and put me back on land safely. I appreciate you." KHOU went off the air as their station flooded, but was later able to start broadcasting when they teamed up with Houston Public Media to broadcast from the other station's studios. And it wasn't just people being rescued. When Valeri Martin got up on Sunday she says she started to check the news to see what was happening. She came across a live broadcast of a local reporter talking to a resident in a nearby neighborhood about 14 dogs tied to a fence. The dogs needed to get to higher ground. Martin says after she saw the footage, she and her friend Christina Paaske, a dog groomer, got a car and drove to find the dogs. "We just got through bathing them and cleaning them up," Martin says. "I do know all 14 of them were saved — seven of them were before we had gotten there, there were seven remaining. We took three and this other lady that was there had four of them in her SUV." People walk through the flooded waters of Telephone Rd. 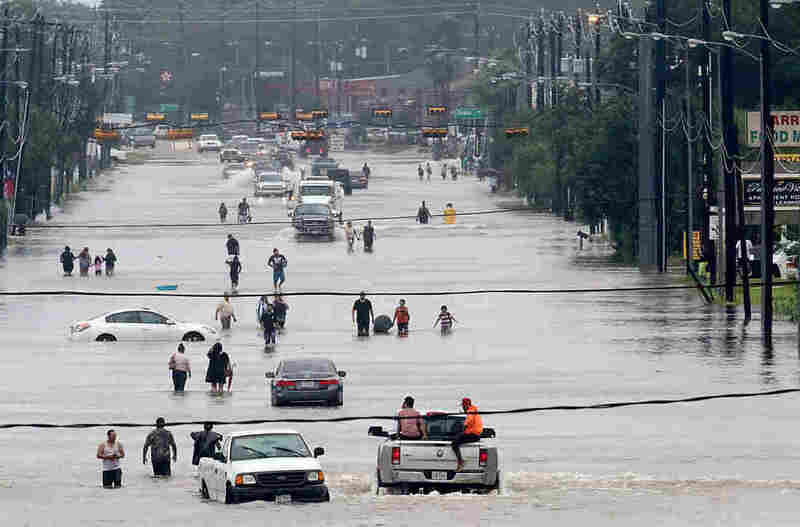 in Houston as the fourth largest city in the U.S. battles Tropical Storm Harvey and resulting floods. Martin took home two of the three dogs. She says her home is a "bursting at the seams" with dogs as she currently has four others and is fostering a fifth one. "We would not have left a dog there," Martin says. "If there were five left we would have taken them all because I cannot leave a dog tied to a fence." Martin said the dogs were cozy and warm while taking a nap after getting food. She says her house has not flooded and she's hoping it stays that way. These pet rescues aren't unique to Houston. In central Texas, the Austin Pets Alive! shelter started asking for fosters and increased donations, before Harvey made landfall, in preparation for the animals they knew would come. As of Sunday, the shelter's website said they had moved more than 235 animals to the shelter and were expecting more. "We have also heard reports of extensive lines of people surrendering their pets, Austin Pets Alive! needs to be ready to help and brace ourselves for additional animal intake. New animal transportations have already started arriving, and we'll have additional animals to save from Houston once the roads open up. A number of shelters are currently non-functioning."